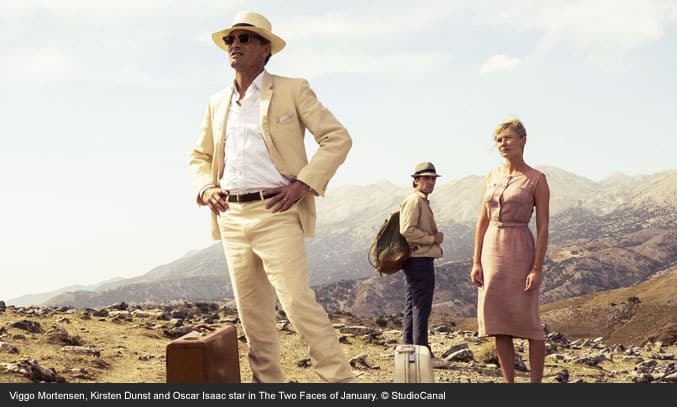 Patricia Highsmith’s tightly-woven thriller The Two Faces of January is on general release in UK cinemas this month, offering movie goers a refreshing break from the contemporary norm. Deep, dark and dramatic, The Two Faces of January follows the story of Rydal (Oscar Isaac), an American rich kid who is foolishly sucked into a fast unfolding web of deceit, murder and jealously. Set in Athens in the early 1960s, Rydal spends his days conning wealthy tourists out of their pocket money. Also staying in the Greek capital is Chester (Viggo Mortensen) and Colette MacFarland (Kirsten Dunst), a glamorous American couple with a dark secret. Infatuated by Colette’s beauty and Chester’s wealth, Rydal befriends the married couple. Unknown to Rydal however, Chester is also a conman, except he’s been playing with the big boys and for much higher stakes. The nightmare begins when a private detective catches up with the MacFarlands, resulting in a clumsy scuffle in a hotel bathroom and a dead body in need of disposal. Rydal catches Chester dragging the detective’s body into his hotel room and is lead to believe that the man has passed out drunk. In the heat of the moment, he foolishly offers to help the MacFarlands flee to Crete. When the news of the murder breaks however, Rydal finds his fate strongly tied to Chester’s and a tense and dangerous battle of wits between the two men begins. As the trio’s journey moves from Greece to Turkey, jealously and paranoia starts to sink in and the lives of Rydal, Chester and Colette slowly start to fall apart. The film finishes with a dramatic finale played out in the back alleys of Istanbul’s Grand Bazaar. Written and directed by Hossein Amini, The Two Faces of January is a classic Greek tragedy that pays homage to the traditional film noir. It’s excellent script, stunning cinematography and unpredictable twist, make it arguably the best Patricia Highsmith adaptation since The Talented Mr Ripley (1999). Mortensen is superb as Chester, his boiling rage increasing with every glance between Rydal and Colette. Oscar Isaac (the actor who fronted Inside Llewyn Davis) also plays a strong leading man as the unlikely hero forced to sweat it out. If you’re looking for period thriller with precision, class and a dramatic twist then The Two Faces of January is the film for you.